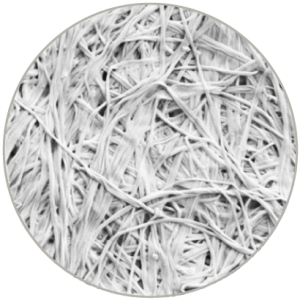 Bio Cellulose is a magical material cultivated 100% naturally using innovative biotechnology and fermentation. 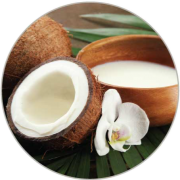 We use a combination of real coconut extract and coconut water to create our bio-cellulose mask base. Agreed, these ingredients taste absolutely blissful, but we wanted to amplify their well-known hydrating and anti-inflammatory properties by putting the mix through the exquisite process of fermentation. 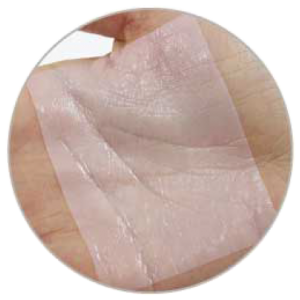 If you’re new to bio-cellulose, imagine a texture so thin and comfortable that when applied, it feels like your own skin. By fermenting, microorganisms break down the (coconut) extract to a much milder and moist jelly-like substance, creating one of the most natural, safe and skin-friendly materials praised in the medical world. 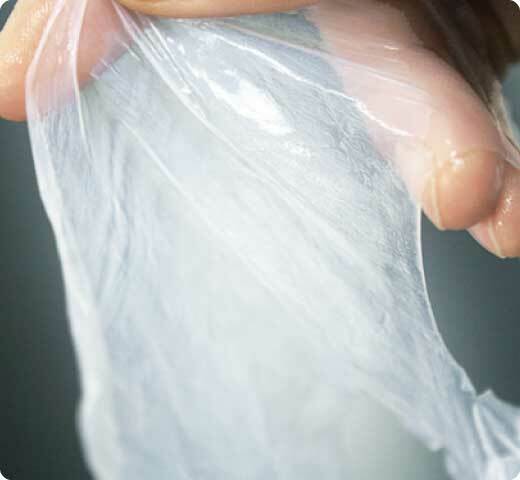 Due to its multi-functionality, bio-cellulose is becoming ubiquitous in numerous industries around the world (including even the most unexpected ones, like electronics). However, bio-cellulose was originally developed and improved for medical applications. 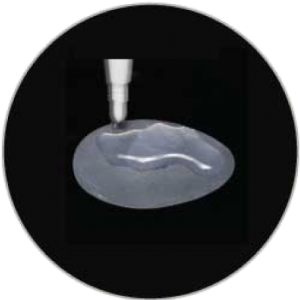 Professionals thought its cool temperature, moisture-holding capacity, and impressive adhesiveness were perfectly suited to heal wounds and treat burns. 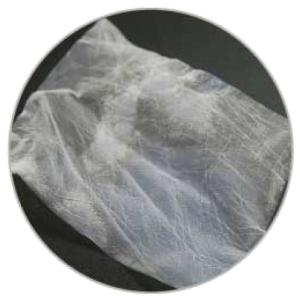 The material’s breathable properties maintain proper moisture to oxygen balance, protecting wounds from infection and accelerating the healing process. Today, bio-cellulose is even being used internally for cardiovascular tissue repair! 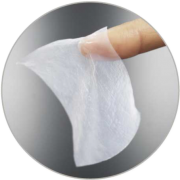 Regular Bio-Cellulose mask bases stay wet throughout their entire production process: from cultivation to sterilization to packaging. In consideration of the fact that bacteria love to camp in damp conditions, these mask bases are treated with a simpler sterilizing method and count on preservatives for safekeeping. 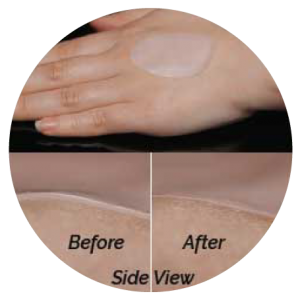 An original, patented Hot Air Bio-Coating Technology to convert naturally obtained wet-type bio-cellulose into completely dried form — hot air to blitz and zap any remaining signs of contaminants, and antibacterial bio-coating on each microscopic fibril so the mask base can stay preservative-free. Regular bio-cellulose masks stay wet throughout their entire production process: from cultivation to sterilization to packaging. Knowing that bacteria love to camp in damp conditions, producers of these mask bases use a simpler sterilizing method and count on preservatives for safekeeping. Where we’re different is in our sterilization technique. 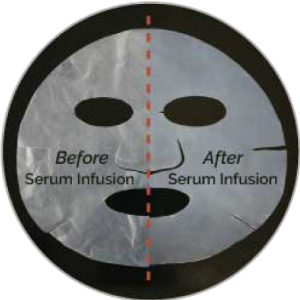 Instead of one simple method, we have a multi-step procedure to ensure you get the absolute cleanest and purest mask base. This dried, purified goodness then gets infused and concentrated with our delectably nutritious 8+1 complex serum, returning to a comfortable texture like your own skin. Simply put, DBC went through a disinfecting desert then found heavenly oasis. DBC is undoubtedly comfortable on the face, because it forms a moist, breathable seal between your pores and the air. Our mask’s jelly-like character is made possible by its dense, three-dimensionally woven structure with 0.1 micrometer fibrils. 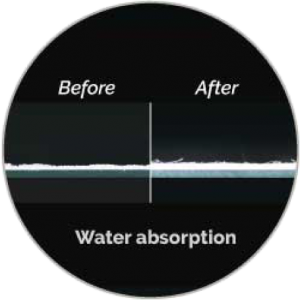 These fibrils aren’t just thin— they’re extremely hydrophilic, meaning they LOVE water. Each of these fibrils drink up and lock an incredible amount of liquid in its tightly-knit structure, up to 200X their dry weight! 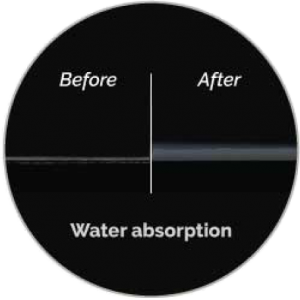 In other words, Dried Bio-Cellulose base allows the concentrated serum in and underside the mask to resist evaporation and stay moist throughout the entire application process, even if the outside of it starts to dry. With DBC, you get more active ingredients held IN the mask, than ON the mask like others. SIMPLY PUT, DBC WENT THROUGH A DISINFECTING DESERT THEN FOUND HEAVENLY OASIS. 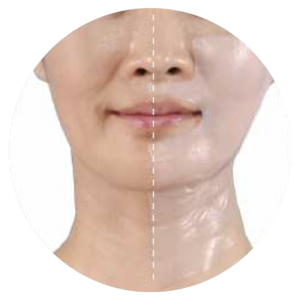 its higher tolerability with all skin types including sensitive skin. 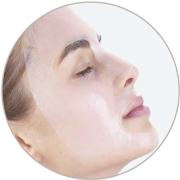 For you to get the maximal benefits from a mask, the side that does touch your face should contain most of the active ingredients and stick well so none of it escapes. Good thing DBC has absorption and adhesion down pat. DBC’s adhesiveness is so impressive that it won’t slide or peel off. This means all your face has to do is relax and sip it all up, while your hands can focus on multitasking, not readjusting the mask. Yes, DBC is thin as skin and feels fun and jelly-like, but don’t let the texture fool you. The three-dimensional nanostructure of dried bio-cellulose is woven just densely enough that it doesn’t feel heavy on your face, but still stays incredibly resilient and resistant to tear. How does a slick mask like DBC stick so well? 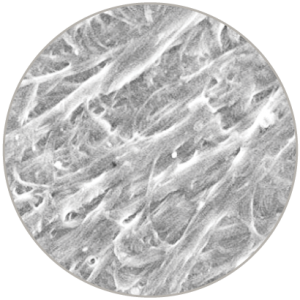 The fibrils in our dried bio-cellulose base are finer than the pores and lines on your face. The fiber measure 0.1 micrometers in diameter— that’s up to 1000X thinner than human hair and 100X less than standard sheet mask. Optimal density vanquishes those stubborn air bubbles you get with other mask types. 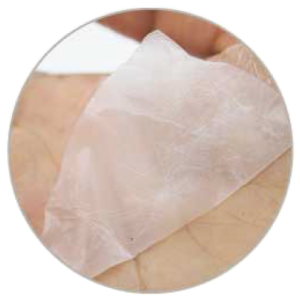 The three-dimensional nanostructure of Dried Bio-Cellulose is woven just densely enough that it doesn’t feel heavy on your face, but still stays incredibly resilient and resistant to tear..
DID WE MENTION THAT DBC IS ALSO ECO-FRIENDLY AND BIODEGRADABLE? popular mask types out there. DBC is the ace base for your face. Our mask’s perfect adhesion, paired with its outstanding ability to transfer the active ingredients pre-absorbed within its base, means there’s nowhere else that the benefits will go, but into your skin— there’s no going back or detouring with DBC, only a one-way ticket straight to your skin. Most people tend to think the serum is everything. But truth is, the base mask itself is as, if not more, important as the “miracle ingredients” in the special formula because the base is what acts as the delivery agent that transfers the benefits in the serum to your skin. While our special coating duly deserves the spotlight, so does its co-star: the 0.1 micrometer fibrils. 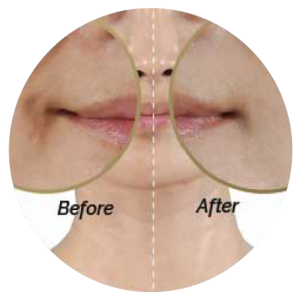 Being significantly finer than most, the fibrils in DBC naturally rest in the hollows of the pores and lines on your face, allowing for a much deeper penetration and transfer of the active ingredients they carry. With that, the fibrils are structured at the perfect degree of density that you get the most even coverage and optimal serum transfer.